Every time I say this title out loud, I want to sing it like from the old Lucky Charms commercial. “It’s deceptively delicious!” Then I jump up in the air and click my heels together. This book was the most delightfully covert thing I’ve read lately. You’ll have to go read the wikipedia link I put there. It’s tickles me to no end to apply that to feeding my children. I have a secret passion for spies and subversive activities. I read “Harriet the Spy” too many times as a child. Anyway, back to the book. 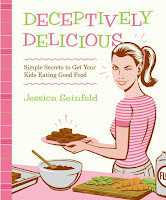 “Deceptively Delicious” by Jessica Seinfeld is good stuff. Yes, Seinfeld, as in Jerry. And no, it’s not particularly funny. But it does have some good ideas. Now, before I go on, if your children have no trouble eating their veggies, then don’t bother reading this post. My children aren’t so angelic and well-rounded as yours, so I needed some fresh ideas. Basically, the author purees veggies and adds them to kid-friendly meals and treats. Spinach brownies, people. Yes, I wrote spinach. I can endorse the zucchini, cauliflower and carrots purees because in the last week, I’ve sneaked them into several standard dishes at our house. And no one noticed! Not even my husband! HAHAHAHAHAHAHAHA! Wow, evil laughter overload. Sorry. Something that Mrs. Jerry stresses in the book is that you don’t stop making vegetables a part of what you serve at the meal, you are just guaranteeing that they are getting them anyway. She also had the wonderful idea of putting out crudités before dinner to fight off the starving whiners and get some veggies in them that way. It so far has worked well with all but my pickiest eater who wouldn’t eat a raw carrot if it was the only edible food to be found on the planet Earth. She’d gnaw on tree bark first. Or starve with the wounded look on her face that she has perfected. Back to the book. It’s great. Fun ideas, yummy-sounding food, and I’m going to try the spinach brownies next. I love spinach, so it sounds good to me. My kids think it’s poison, so we’ll see what happens when it’s chocolate-coated. 4 responses to "Deceptively Delicious". Comments are closed for this post. You are such a delight! I love your happy attitude. This book sounds really great. I will tell the library, see what they say. love you and Merry Christmas! Sounds yummy, I might have to try it out anyway. I never seem to eat enough vegetables, so it sounds like a good way to get some more in. Is it difficult to make all the purees? BTW, it was so fun to talk to you yesterday! You can get this cook book at Costco right now! Thanks for introducing it to us. We have an extremely picky eater, and I look forward to trying all the recipes!